As you will see from my recent wishlist post, I have been thinking a lot about furniture lately. Namely; furniture for small, but growing, boys. When they get to that age where you have to really consider what you buy, because it won't be long before they are teenagers. It has to last and it has to be able to grow with them, so they are not embarrassed about it in a couple of years! I spent a lot of time visiting as many children's furniture websites as I could to research my wishlist post and was surprised at how difficult some of them were to navigate. I was also surprised at how few there were that cater for older children and teenagers. There were a great deal that had lovely, cute designs for small children, but I need something more stylish and a lot more practical. My interest is in clever storage and innovative design, not what cartoon it's based on! I was really pleased to be introduced to Room to Grow. 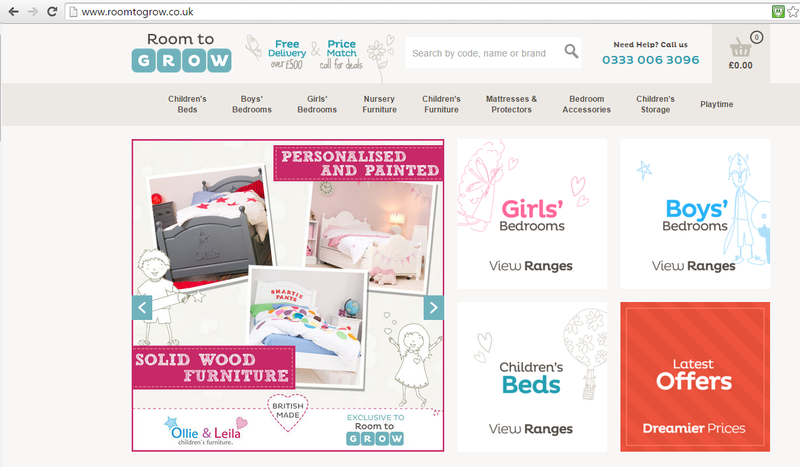 As the name suggests, this is a website that caters for children and it does it brilliantly. One of the biggest problems I have with shopping websites, is when the navigation is difficult. It's surprising how often it happens, it just seems needlessly tricky to find what you need. I have included a short video, to show you just how user friendly this website is, but check out this home page layout. Refreshingly straight forward! As I am a big fan of clever storage (it's all I talk about! ), I am particularly fond of the high sleeper beds at Room to Grow. I have never seen a selection this vast, and the designs are really imaginative. I love how they are modern and fun for a young person's room, but could easily be equally acceptable to a teenager, which makes them really good value, because they would last for many years. There are so many amazing examples I could show you, like this fantastic Mezzanine bed that even has a wardrobe! It's almost like a whole bedroom in one bed! For the space-conscious this would be a fantastic addition to a room. It's currently reduced from £855 to £599 in the sale! This one has it's own little lounge room underneath, which would really suit a young person who is starting to appreciate their own space. This would be so lovely for when they have their friends round. I love how it can even accomodate a TV and the sofa folds out into a guest bed! This one is also in the sale, reduced from £1073.75 to £749 and comes with a free light. I have to say though, this is my personal favourite. It has so many great ideas involved with it, the designers clearly have children! The little sofa, which also folds out into a guest bed, looks so comfy and the little built in shelf is really clever, taking up barely any space, but providing a very useful area for drinks next to the sofa. The slight angle of the ladder looks really fun, and makes the area underneath seem bigger, so it doesn't feel so enclosed. All the shelves and cupboards would accomodate any amount of odds and ends and 'collectables' *sigh* and the doors are also available in white or antique pine. The best part, though, is the high shelf. I would have killed for a bed shelf when I was little. There was never anywhere to put drinks, or anything for that matter, when I had a high sleeper and I applaud the geniuses who came up with the idea! There are lots of bargains to be had on the website at the moment, so it's a great time to have a look around! There follows a short video, to show you how easy it is to choose your child's new bed, using the astounding simple clicky-buttons. The quality varies as the cameraman was L and he got a bit distracted by all the awesome new furniture he would quite like! Produced in association with Room to Grow and based on my unbiased opinion. 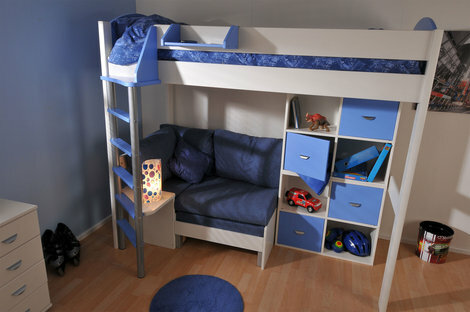 I love the cabin beds, Leo is after one for his room! We will soon no doubt be in the market for one! I need to check out more on this i am moving all the kids bedrooms round at the minute and struggling to fit them all in! Love the kids rooms on here im terrible at interior design and need all the help i can get with space saving ,i think the bottom pic would be perfect for my older sons room :),Lisa marie smith. I love the look of mezzanine beds, and how much space they save but the big downside is changing the sheets!!! I hate having to climb up there and struggle with the bedding! The kids should do it of course, but somehow they never do. So pretty and so practical and that is the best thing ever with kids and messy bedrooms! My husband is literally just building our son's new bed. Trouble with the ones that fit everything underneath is they are just so high. Our 7 year old is in one and he has to be careful not to bump his head on the ceiling. We have opted for a much lower one with a pull out desk for the 6 year old. Sounds like that website is just great for figuring out exactly what is right for your needs. I do like the idea of a multi-functional sleeper bed. Am going to have to look into this. We have a midsleeper at the moment, but I think we want to upgrade to one of these eventually as the storage looks amazing! Oh I love these Lucy, what a brilliant idea. POD just has a bed in her room but we're having real storage issues. We really need an extension for her toys but I don't think that's going to happen any time soon LOL! I love the jdea of high sleepers, Emmy would love one for her room however this isn't a good idea just yet as she usually ends up in my bed and her dad ends up in hers.